Allen Dulles SuperSpy Head of CIA, Operations PaperClip and MK-ULTRA, Fired by President Kennedy, Worked on Warren Commission to coverup truth of JFK’s assassination; CFR big shot: Read this whole article. – end quoted passage from American Historical Association article by Gordon A. Craig. As we note Mr. Hoffmann’s observation that ‘statecraft’ emanates within the system of a domestic society and comes to operate within what is called an ‘international system’, we approach also a phenomenon known as “Policy”. It is as though Statecraft produces or affects or influences Policy, and in some circles that supposition is upheld as the prime purpose of Statecraft. Policy is shaped, produced, and made manifest through history by the workings of Statecraft, so we may say as a premise that Statecraft in some ways produces Policy, and that Policy is the outcome of the practice of Statecraft. I would suggest that there is domestic policy, and there is foreign policy, and there is, even for some individuals at this late date in American history, personal policy. I am supposing that foreign policy is derived from the sum total of activities within domestic policy, and that domestic policy must derive from the interacting and originating personal policy of as many individuals as may exist, interact, and/or compete within the domestic totality. American history may be seen as a long sequence of competing efforts to shape Policy. Competitors in Statecraft within a society may be called “Players”. We may now like to view the world through the life of one very active and involved Player named Allen Dulles. 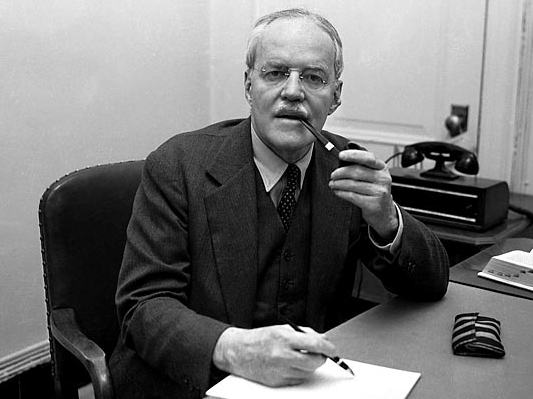 But Allen Welsh Dulles had a brother, John Foster Dulles, and because both brothers contributed in significant ways to American foreign Policy it is difficult to treat of one without also treating of the other. Never-the-less, let us focus primarily on Allen Dulles. To begin, let us go back into history and note that in the late 1700s a handful of radical malcontents in the North American British colonies had taken a disliking for British “Policy”. Their consensus opinions, shared and enhanced by the pooling of their interacting perceptions, led to the American Revolution which we commemorate each Fourth of July as “Independence Day”. As an exercise of Statecraft, the American Revolution was hardly sophisticated. In fact, it was a rather blunt and brutal affair, a boisterous bout of Brit-bashing which cheered, in its final military victory, a previously meek and submissive western civilization, a world which sought a more direct and compatible representation of itself regarding the Policy of governance. What these Players did was quite illegal, and the authority of the Throne sought to control them by the employment of what we today would call “law enforcement” which acted in the name of British Security. Warrants were issued for the arrest of some of those Players. Other Players who preferred to be law-abiding and subservient to the Throne and who were content to prosper under the authority of that Throne and its Policy included traditional British Tory “Houses” of wealth, security, and comfort. A number of New England families of the Tory persuasion had long enjoyed business relations with the mother country, England, and did not want to jeopardize their businesses. To such families, George Washington’s band of violent malcontents and illegal efforts at revolution seemed to pose a threat to their secure and profitable relations with England. It was from such understandable motives that the “Loyalist” opponents to the Revolution came. Many Tory families, to which we may refer as “Houses”, resisted the revolution, snitched-off the troop movements of Washington’s army, aided the British soldiers, manipulated finances and other leverages, and in general tried to assist the Throne in maintaining its authority over its Colonies. The prevalent view of the day was that England legally owned the Colonies, which were therefore legally subject to the Throne’s “foreign policy”, or, as we now may call it, the Throne’s “distant domestic Policy”. In truth, our American Revolution was an act of outlawry, was illegal, employed much violence and death-dealing, and could successfully be prosecuted as such in any court which might try the culprits. In today’s political jargon, our founding fathers would be called “insurgents” and “terrorists”. Whether the Throne used the term or not, the British Policy consisted of what Stanley Hoffman in the quotation above called “Statecraft” as perceived and employed in the governance of the individuals who comprised the populations of the Colonies in North America. Statecraft. As Mr. Hoffman notes, Statecraft emanates from domestic society and operates in the international community as “Policy”. I wish to note here that the British Empire has given us a precedent in which a Western Civilized Empire, of and with a “Christian bent”, did indeed exercise as a matter of official “Foreign Policy” the international smuggling of a narcotic drug (opium) for the expressed purpose of bolstering the Empire’s economy. Further, the British government displayed a willingness under Lord Palmerston (Prime Minister of Great Britain) to use military force (the British Navy’s battleships) to protect and expand its smuggling enterprises. This is now known history, and is a precedent. The key word here is precedent. Smuggling opium was official British Policy and it incorporated the Bank of England’s relations with the Throne, so that we now can see a combination of financial and military forces working in tandem to effect and expedite British governmental Policy to smuggle opium into China. The unrestricted light of knowable history shows today quite clearly that the British Navy was employed to force China to accept British importation of opium into China, and shows that such deeds were matters of British Foreign Policy. Lord Palmerston contributed to that style of statecraft. Joseph Heatly Dulles, while not working for the Massachusetts House of Russell in direct opium-smuggling, was instead involved in the slave trade until relocating to South Carolina and Pennsylvania. Because the British East India Company was involved in both opium-smuggling and slave-shipping, and because he was at Yale, we find it easy to understand that J. H. Dulles would have been in contact, directly or indirectly, with those New England Tory Houses who were in business with the opium-smuggling aspect of the East India Company, and we now know that J. H. Dulles was a member in a secret society at Yale. It is from those early associations that we today draw the parallels which may be seen by association as a, perhaps – or perhaps not – un-organized collusion. From such roots sprang Allen Welsh Dulles and John Foster Dulles. Harriman Brothers was deeply involved in the reconstruction of Germany after World War I. The most powerful partners in Harriman Brothers were E. Roland Harriman, his brother Averell Harriman, and George Herbert Walker. When Prescott Sheldon Bush married George Herbert Walker’s daughter, Mr. Bush was not a powerful man, but one who was about to become powerful – with the assistance of the Harrimans and their partner, George Herbert Walker. “Future great names of America’s intelligence service were among the reverent callers to Allen’s suite: Kermit “Kim” Roosevelt, grandson of Theodore, collecting stories for an official history of the OSS; Tracy Barnes, reliving the days with Countess Ciano; Richard Helms, bringing news of Germany; Frank Wisner… ; Per Jacobsson and Royall Tyler passed through New York; Jacobsson had been named managing director of the International Monetary Fund, and Tyler was to be head of the Paris office of the World Bank. Prescott Bush was Skull and Bones; the Dulles brothers were Council on Foreign Relations with Yale connections going back to their great grandfather. The mother of the Harriman brothers hosted the 1932 World Conference on Eugenics in New York City and brought in the man who would become Adolph Hitler’s master Eugenicist, Ernst Rudin, whom the elder Mrs. Harriman lauded publicly in the press by noting that it was unfortunate that more Americans did not agree with Mr. Rudin’s and Adolph Hitler’s views on “racial purity”. While this is all established in the public record, in newspaper archives, the Congressional record, old magazine articles and interviews, State Department files, books, and in corporate records which are available to the public today, it yet strikes one as horribly ugly to have to realize that a death-cult with connections to European schools of the occult, (Skull and Bones, as brought to Yale from Germany/England occult banking-elite families by W. H. Russell) – and the most powerful private-sector think-tank to ever directly affect U.S. foreign Policy, (the CFR) – and Hitlerian principles of eugenics, (“racial purity”) – were each and all combined and represented in fact – not just symbolically – by the business partnership between the Harriman family, the George Herbert Walker family, and the Prescott Bush family. That their commonality takes each family back to the anti-American Revolution treacheries of the old Tory Houses of New England, the loyalists who opposed our independence, only further stitches an ugly warp and woof into the fabric of American history. International business needed international law, which called for international lawyers. Allen Dulles of the prestigious law firm on Wall Street, Sullivan and Cromwell, was one of those lawyers in the 1920s and throughout the 1930s when Wall Street assisted the buildup of the Third Reich. Today we know that IBM furnished the German government what would become the predecessor of today’s computer, which Adolph Hitler used to number the Jews. We know that Exxon’s parent corporation, Standard Oil of New Jersey, a Rockefeller corporation, did patent-sharing with I.G. Farben of Nazi Germany to put the fuel in Hitler’s trucks and tanks and aircraft. We know that some of the ownership of the Hamburg-Amerika steamship lines sat on the board of Union Banking Corporation with Prescott Bush, who used Hamburg-Amerika to channel the payroll funding of Hitler’s Brown Shirts. We also know that Fritz Thyssen held a presence at Prescott Bush’s Union Banking Corporation. Allen Dulles played a role in all that. We also know that on October 20, 1942, ten months after we had declared war on Germany, the assets of Prescott Bush’s Union Banking Corporation were seized by U.S. government vesting order number 248 under the “Trading With The Enemy Act”. President Roosevelt’s Alien Property Custodian, who signed the vesting order, was Leo T. Crowley. (2 in notes, page 20) George Herbert Walker, the Harrimans, and Bush had continued to do business with Nazi Germany for months after the U.S. Congress declared war on Germany. In the middle of it all stood Allen Dulles, who would join his brother while President Truman was still in office to arrange the damage control that was needed after Hitler’s fall. Allen Dulles and John Foster Dulles, two Wall Street lawyers who had done the lion’s share of the financial arrangements which empowered Adolph Hitler and his Nazi party across the 1930s, in 1947 went to Clark Clifford, President Truman’s closest adviser, and assisted in the creation of the “National Security Act of 1947”, which Truman signed into law. No one representing the European oligarchies wasted any time once they had the CIA installed under official government roofs in America. One of the first matters in which the CIA engaged secret action, upon the suggestion of Allen Dulles, was an ongoing plan called “Operation Paperclip”, in which the CIA salvaged hundreds of German Nazi war criminals and snatched them out from under the Nuremberg War Crimes trials and hid them inside the CIA and other Federal Departments and Agencies including the government’s space program (NASA) and the Department of Agriculture. I would like to emphasize that point – the newly-created CIA, itself created by Clark Clifford and one of Hitler’s biggest Wall Street lawyers, extending an activity begun under the OSS, immediately hid known Nazi war criminals inside its secret corridors and offices, here and abroad, and spared them from international justice after the fall of Hitler. I would submit for consideration that that pregnant fact itself, as one interesting fact among others, gives birth to more than simple speculation regarding ulterior motives in the mind of Allen Dulles. Among the Nazis brought into the CIA was Reinhard Gehlen, the triple-agent who had masterminded Hitler’s eastern European spy sectors. That travesty was Allen Dulles’ idea, worked through the very CIA he had helped create. Another despicable Nazi war criminal hidden inside the CIA was Klaus Barbie. These names are searchable online. Moving forward in time, Allen Dulles became the DCI (Director of Central Intelligence) at the CIA he had helped create. As DCI of CIA under Eisenhower, Allen Dulles was tasked with the briefing of the next incoming President, John F. Kennedy, when Eisenhower was leaving office. At the briefings which touched on Eisenhower’s secret plans to invade Cuba, which Allen Dulles had to sell to the incoming Kennedy, was another Skull and Bonesman, Richard Bissell, the number-three man at CIA. Kennedy granted the needed new “Finding” to carry on with the process of training a clandestine army for invading Cuba. But Kennedy made it clear that the U.S. government could not possibly be overtly involved in this illegal invasion – a fact which precluded the use of U.S. military aircraft as support for the beach landing assault. Dulles and Bissell had other notions, but they left Kennedy slightly in the dark about their truest intentions regarding exposure of U.S. involvement in the invasion. But Allen did not say this to Kennedy. Nor did Bissell or General Pearre Cabell, Allen’s principal deputy, as they sat in the secretary of state’s office late Sunday night, April 16, when Rusk called the president to present their arguments for reinstating the air strike. Kennedy was unpersuaded. Rusk removed the telephone from his ear and held it out across the desk, inviting Cabell or Bissell to make their case to the president directly. Weary and discouraged, they declined. Perhaps, but the fact remains that for decades to come CIA was accused of violating the trusts of the democracy that created it, of arrogance in the absence of accountability, of operating like an “invisible government”. CIA stalwarts scoffed at the charges, but it can now be argued convincingly that in the Bay of Pigs operation the clandestine services were behaving just as the critics charged. From the start and throughout, both Eisenhower and Kennedy had been adamant that no United States military personnel would be permitted to participate in any combat action against Cuba. Kennedy had said as much in a press conference on April 12, the week before the landing: “There will not be, under any conditions, an intervention in Cuba by the United States armed forces.” The leadership of CIA ultimately did not accept the president’s words. Whatever the stated policy, Allen and those around him adhered to the comfortable belief that the armed forces of the United States would back them up in preventing the failure of a covert action, no matter how botched or ill conceived it turned out to be. Evidence for this serious charge appears in Allen’s typed and hand-written, coffee-stained notes, which were preserved with his personal papers at Princeton. In this tentative form he voiced candid explanation for his failure to disabuse Kennedy of the key misunderstandings, about the guerrilla option and the covert nature of the invasion. ~ End quoted passages from Gentleman Spy by Peter Grose. Long story shortened, the invasion of 1961, known forever as the Bay of Pigs Fiasco, blew up in the CIA’s face – and in Kennedy’s face. In an attempt to save face, Kennedy ordered an investigation, and he subsequently fired Allen Dulles from his post as DCI of CIA. Some time later John F. Kennedy was shot dead in Dallas, Texas. After Kennedy’s murder, Allen Welsh Dulles, the man who had helped engineer the rise of the Third Reich, the man who had helped create the CIA, the man who had sat finally atop CIA as Eisenhower’s DCI, the man who had initiated the CIA’s “mind-control” research, the man who had staffed the CIA with Nazi war criminals, the man who held oversight responsibility for the failed and disgraceful Bay of Pigs, the man who was fired from atop the CIA by President Kennedy – was appointed by President Lyndon B. Johnson to sit atop the Warren Commission which would investigate the assassination of President John F. Kennedy. 1: Allen Welsh Dulles was a lawyer at Sullivan and Cromwell on Wall Street, and an early member in the CFR (Council on Foreign Relations). 2: He worked the international legal interface between Wall Street firms and the build-up of the Third Reich in Nazi Germany. 3: He specifically served the legal needs of two financial organizations on Wall Street which supported Hitler’s Nazi infrastructure – Harriman Brothers and Union Banking Corporation – both of which were seized by the government under the Trading With The Enemy Act. 4: After Hitler’s defeat, Allen Dulles assisted Clark Clifford in writing the National Security Act of 1947, which created the National Security State, which in effect supplanted the Federal government of the United States of America. That act (with amendments in 1949) also created the Black Budget, the NSC, and the CIA. 5: In the CIA’s formative years Allen Dulles initiated Operation Paperclip, which brought into the U.S. Intelligence community hundreds of Nazi war criminals, and deliberately hid them from war crimes prosecution while employing them in U.S. government agencies, including CIA. Allen Dulles initiated, using some of those Nazi war criminals, Project MK-ULTRA, which was the centerpiece in CIA’s mind-control (behavior control) research and development – a legacy investigated by the U.S. Senate. 6: Allen Dulles became DCI at CIA under Dwight D. Eisenhower, then briefed the incoming John F. Kennedy on Ike’s secret plans to invade Cuba with a clandestine CIA-trained army of mercenaries. 7: Allen Dulles and Richard Bissell oversaw the Bay of Pigs invasion, which blew-back in Kennedy’s face and caused Kennedy to investigate the invasion, and its sources at CIA, publicly. 8: John F. Kennedy subsequently fired Allen Dulles from his post as DCI of the very CIA which Dulles had helped create, after which John F. Kennedy was shot dead in Dallas, Texas. 9: LBJ appointed Allen Dulles to the staff of the Warren Commission to investigate Kennedy’s murder. I close by noting that transparency is absolutely necessary in any representative government. When government deceives the citizenry behind a cloak of ‘national-security secrecy’ and clandestine statecraft, that government cannot be said to be representative at all. When government is given the “legal right” to lie, which is exactly what is at the core of the National Security Act of 1947, democracy cannot exist, even within a Republic of law. Today’s woes, both internationally and domestically, may in large part be traced back to this sort of mischief in statecraft. But consider this: if the press and the media fail to bring such things to public attention, and if the NEA, by controlling the content of public school textbooks, suppresses this sort of American history, can Americans be truly said to be informed when they go to election booths? How else should we interpret this sort of secrecy in statecraft if not a deliberate abuse of our vested power and our trust? by Joel Kramer and Diana Alstad; North Atlantic Books, Frog LTD, PO Box 12327, Berkeley, California, 94712. ISBN: 1-883319-00-5.
by Webster Griffin Tarpley and Anton Chaitkin; Executive Intelligence Review; Washington, D.C.; 1992.Fascimile Edition – Reprinted and copyrighted 2004 by ProgressivePress.com, an imprint of “Tree of Life Books”; P.O. Box 126; Joshua Tree, CA 92252; Second printing February 2005; ISBN: 0-930852-92-3. Original edition 1992: ISBN: k0-943235-05-7; Library of Congress Catalog Card Number: 91-78005; EIB 92-002; Executive Intelligence Review, P.O. Box 17390, Washington, D.C. 20041-0390.
http://www.dunwalke.com/1_Brady_Bush_Bechtel.htm Ms Fitts was a managing director and member of the board at Dillon Read & Co. Inc. before accepting a post in the Bush-41 Administration. She gives us an insider’s perspective on how Wall Street does what Wall Street does. Her work is an indictment and a revelation.